Is data changing the way you do business? Data-driven applications enhance online customer experiences, leading to higher customer satisfaction and retention, and increased purchasing. The challenge is that the capture, retention, and use of all of this data can be costly to scale and manage. 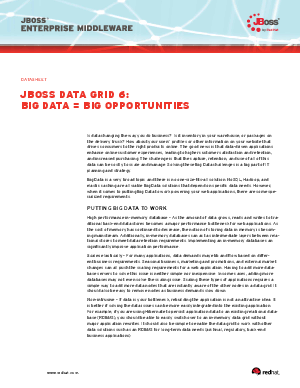 Red Hat is well aware of the Big Data challenge and it's impact. Providing a means to more effectively scale the data tier gives enterprises a flexible and cost-effective means to do more with their applications.